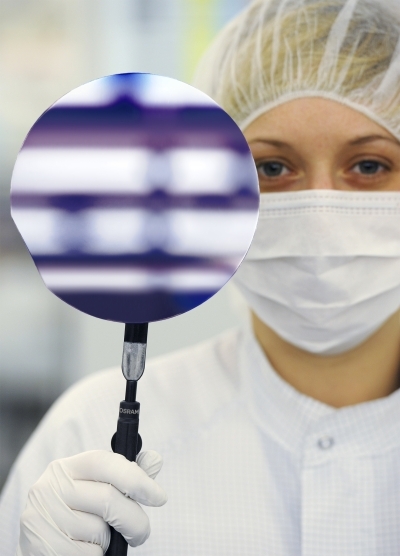 OSRAM high-performance LED chips based on InGaN technology today are fabricated on wafers with a diameter of 6 inches. “Our investments in years of research are paying off, because we have succeeded in optimizing the quality of the gallium-nitride layers on the silicon substrates to the point where efficiency and brightness have reached competitive market levels. Stress tests we've already conducted demonstrate the high quality and durability of the LEDs, two of our traditional hallmarks," says Dr. Peter Stauss, project manager at OSRAM Opto Semiconductors. The company has acquired comprehensive expertise over the last 30 years in the process of artificial crystal growth (epitaxy), the foundation for this milestone in the development of new manufacturing technologies. The German Federal Ministry of Education and Research funds these activities as part of its “GaNonSi” project network. This is a pioneering development for several reasons. On account of its widespread use in the semiconductor industry, the availability of large wafer diameters and its very good thermal properties, silicon is an attractive and low-cost option for the lighting markets of the future. Quality and performance data on the fabricated LED silicon chips match those of sapphire-based chips: the blue UX:3 chips in the standard Golden Dragon Plus package achieve a record brightness of 634 mW at 3.15 volts, equivalent to 58 percent efficiency. These are outstanding values for 1 mm² chips at 350 mA. 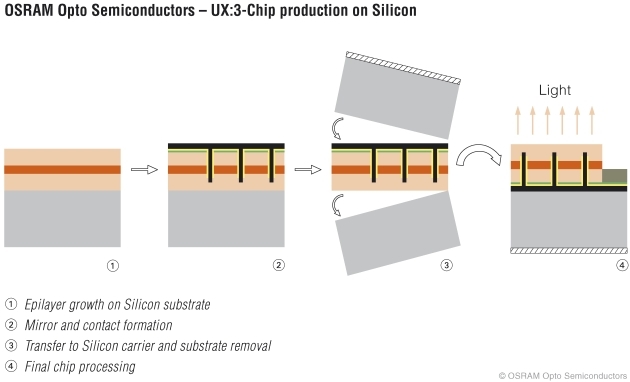 In combination with a conventional phosphor converter in a standard housing – in other words as white LEDs – these prototypes correspond to 140 lm at 350 mA with an efficiency of 127 lm/W at 4500 K.
The process diagram shows the production of a UX:3 chip on a silicon wafer. “For these LEDs to become widely established in lighting, the components must get significantly cheaper while maintaining the same level of quality and performance,” Stauss emphasizes. “We are developing new methods along the entire technology chain for this purpose, from chip technology to production processes and housing technology.” Mathematically speaking, it is already possible today to fabricate over 17,000 LED chips of one square millimeter in size on a 150 millimeter wafer (6 inch). Larger silicon wafers could increase productivity even more; researchers have already demonstrated the first structures on 200 millimeter substrates (about 8 inches).